During the last few years, the market of wearables has not only been expanded but it really has skyrocketed. Fitness trackers have given rise to smart watches and many other niche offerings which include stress trackers, smart bandages and many more. Those does not even feature other mHealth solutions, for example web-connected glucose meters, which even now provide health data for the cloud with no need to wearing them at all times. According to CDW Healthcare, wearables could possibly save the healthcare system $200 billion during the next 25 years. Smart technology is obviously something which is going to be the answer to the efficient operating of the future society, particularly when it is about healthcare. The wearables market throughout the world has celebrated its 8th consecutive quarter of progressive growth during the 1st quarter of 2015, as mentioned in an IDC report. The IDC report said that the vendors have shipped an overall total of 11.4 million wearable products in the first quarter this year, which is 200% increase from the corresponding last year when it was around 3.8 million wearable products were shipped. On the other hand, ongoing growth is associated with innovation, hence the leaders of the industry, which include Fitbit, along with newcomers are aware of the user expectations related to services and the use. Ramon Llamas, research manager, at IDC wearables, informed that the leadership of Fitbit is associated with a number of factors, which include the quality of device and the user experience. Llamas mentioned that he expects the company does not have a knee-jerk response in moving towards the smartwatch sector, after the launch of Apple’s Watch. We have seen a groundswell of interest to the company to enter smart watches which allow for the 3rd party applications, however I disagree, he said. That significantly changes the proposal for Fitbit, rather than working on its primary mission – change behaviors to fit a healthier lifestyle. A couple of weeks after IDC report arrived Fitbit stated that it has been refiling for the initial public offering using new documents planning to raise $358 million with an expected value of $3.3 billion. This amended filing was introduced in the heels from a lawsuit from a competitor Jawbone which claims that the Fitbit is poaching employees, on top of that, latest Argus Insights study reports the wearable maker is battling and therefore its leadership with wearables is below 50%. Llamas said that, Fitbit’s continuous market leadership is actually associated with working on offering users with increased prescriptive data as well as insight about practical areas, and additionally expanding features associated with user interaction. The research company anticipates about decreasing price ranges on wearable tools, consisting of displays, processors and sensors, will also get the better shipment figures. All of them are turning to be more cost effective, and the vendors are usually in a position to possibly pocket or move the savings to the user, Llamas said. Worth erosion is going to be steady and caused by various areas quicker than the others, similar to a health & fitness tracker compared to a smartphone. Llamas believes that the market winner may be the one among the most ideal brand. The challenging part is even differentiation, since a lot of devices and the vendors are trying to do the same thing. We should get creative and also pull in new elements, including social media and activities, linking to systems, working on certain niches, particularly around the enterprise, and also we are till now simply scratching the surface upon exactly what health & fitness applications should be introduced to bear, Llamas said. The wearables relating to the healthcare industry is obviously a market which will significantly grow during the period of 2015 which will continue in to the future. The technology is obviously very innovative while the best thing would be that it is obtaining FDA clearance along with other medical clearances by the regulatory boards from around the globe. 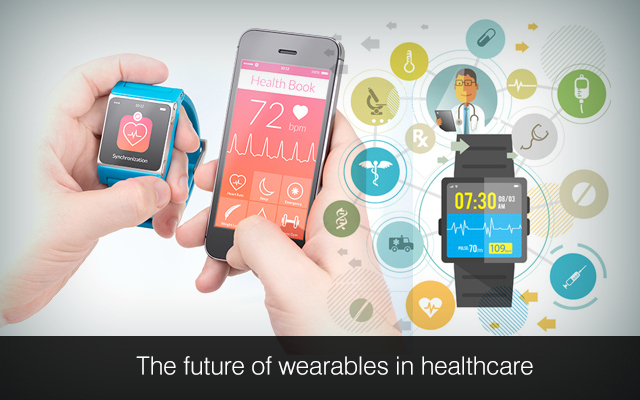 Cloud based technologies even are going to playing an important role in the healthcare smart wearable market. Even though some technologies are now in development phase and are usually getting informed to the general public, some were already out for a couple of months. However these products should really begin to be more aware for the general public and start to move towards making the year 2015 as the year of smart wearable specifically for the healthcare industry. Smart wearable technology within the healthcare industry will certainly discover a number of inventions in the near future. At Mindfire Solutions, we have been providing custom healthcare software development services to our esteemed clients for more than 11 years now. Our healthcare team can help you with custom EMR, HER, PMS and CPOE development to name a few. Please feel free to write to us in case of any custom healthcare needs and we will revert back in one business day. You can also avail our limited period Risk-Free Trial offer. This Post was posted in Health Care and tagged Customize EMR/EHR system, Develop Electronic Health Records, Develop Electronic Medical Records, EMR EHR Software development, healthcare it development, healthcare software development, Risk-Free Trial, web based EMR/EHR development. Bookmark the permalink.